I am not a morning person. I am just not! I have tried becoming one, but it has never really worked out. I have always envied those people who are all bright and chirpy first thing in the morning. To help me become a more morning loving person my friend introduced me to Clean & Clear Morning Energy Face Wash. Her logic, anything that can infuse me with a dose of energy in the morning, I should try it out and see! Since I have tried out everything from herbal tea to meditation techniques, I decided to give the face wash try. Anything that will help me hate the mornings a little less. While the face wash has not made me a morning person, it has managed to energize my skin and retain the morning freshness throughout the day. Trust me,like me, if you are someone who is doomed with oily skin, any product that can make your skin look fresh throughout the day is a boon. I have been using Clean & Clear Morning Energy face wash for over 10 days now. As the days progress, I have started seeing the results. While there has not been a drastic change the overall results have been positive. After I started using the face wash my face looks less oily and shiny, which is a major blessing for someone with oily skin. 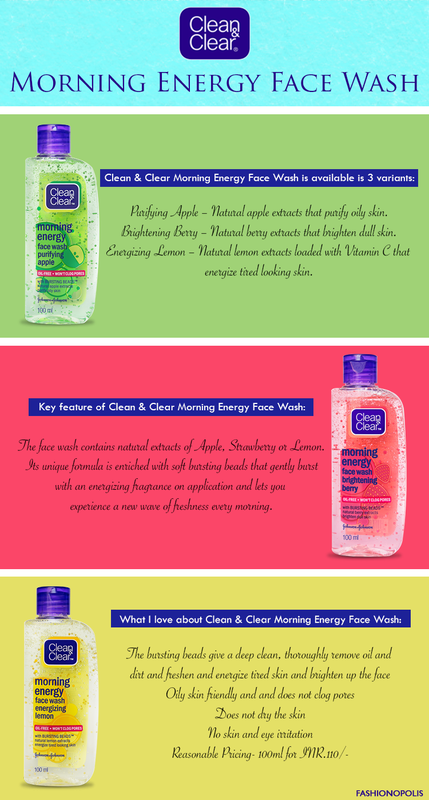 Here are my views about Clean & Clear Morning Energy Face Wash.
Clean & Clear Morning Energy face wash works like a magician and brightens up the dullest skin. Thanks to the bursting beads, you can get a burst of morning energy at any time of the day. The face wash is available in three fruity variants. Each one has a distinct, no-overpowering scent that lingers in a pleasant way. The rich foam lathers well and thoroughly removes all excess oil and dirt. The special ingredients help prevent common skin irritation without drying your skin. The highlight of Clean & Clear Morning Energy face wash is the bursting beads- its trademark feature. These beads gently burst and exfoliate your skin and leave it looking fresh and glowing. 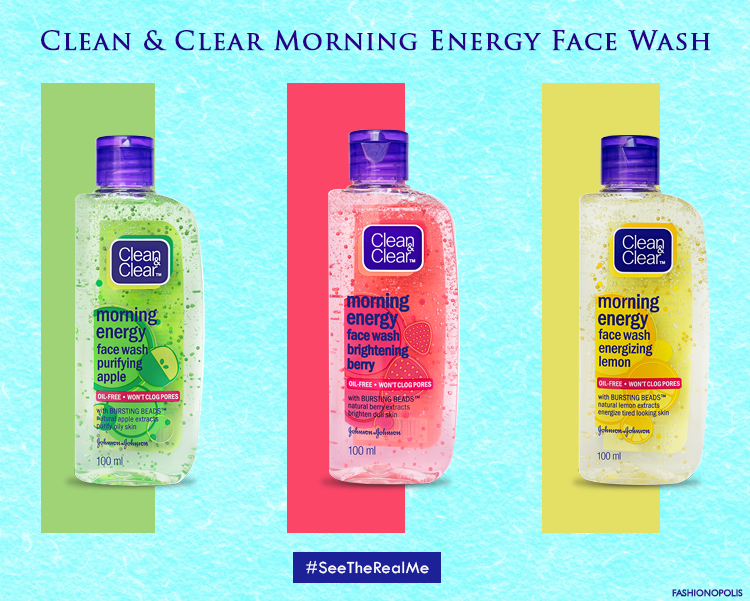 As much as I love the product, it is Clean & Clear Morning Energy Face Wash’s #SeeTheRealMe campaign that has won me over. Through the #seetherealme campaign, teenage girls are encouraged to show the world who they really are and not give too much attention to what people think about their looks or complexion, hair, clothes or shape. With so much pressure on women, especially teenage girls, to look a particular way, this campaign comes as a breathe of fresh air. It emboldens teen girls to be proud of who they are and let the world #seetherealme! Please Note: Before using/ buying any of these products please make sure they are right match and compatible with your skin type. 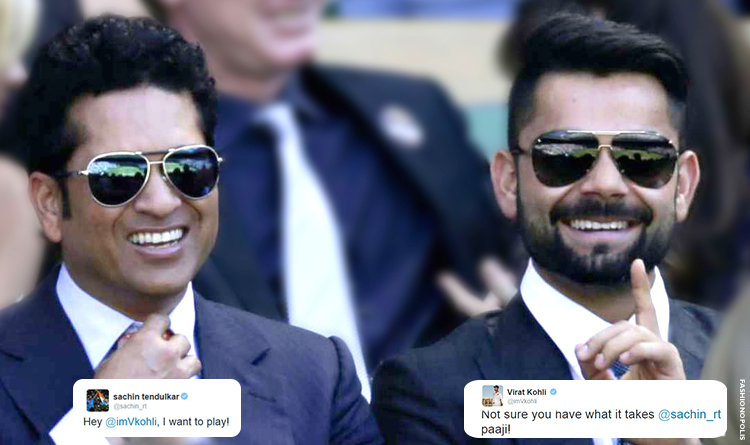 It all started with this one tweet from Sachin Tendulkar to Virat Kohli and Virat’s cheeky reply to that tweet. And then, like they say, rest is history. Tweets from Sachin Tendulkar and Virat Kohli's official handle. So what exactly got the current captain of India’s cricket team and the Master Blaster indulging in some healthy Twitter repartee? A game, of course! But not the one these two are famous for playing. This is a one-of-a-kind, lifetime opportunity game that can make you win a Hangover style trip to Las Vegas with 3 of your best friends! Wondering how exactly can you make that happen? Then drop everything you are doing head straight for the Wrogn Auditions. The Wrogn Auditions is a campaign by Wrogn, a breakaway men’s fashion brand. Staying true to the brand's philosophy, the campaign is a unique concept that invites audience to ‘Audition’ and try their luck at winning a Hangover in Las Vegas. The only thing standing between you and your dream Hangover style trip to Las Vegas are a set of 10 question. Simple, right? No, not really! To crack all 10 questions and levels you need to impress Virat with your answers. In his trademark cool and dapper demeanour Virat asks some brain teasing questions. As you progress the questions keep getting trickier! On top of that, you have a timer to keep an eye out for! But then, when it comes to Vegas, the stakes are always high! From the minute I found out about the game, I was completely intrigued by it and decided to give it a try. With a dramatic design, eye-catching graphics and cool sound effects the game has you hooked on from the minute you press play. On my first attempt I got out on the third stage. Not one to accept defeat, I decided to give it another try and managed to ace it. Answered all 10 questions! If I may say, Virat was might impressed! Without revealing too much, the trick to acing the Wrogn Auditions is having a clear mind and answering in a smart and clever manner. I know this does not sound much or very helpful, but trust me, this is all you need to crack all 10 levels of the game and get yourself closer to the jackpot. 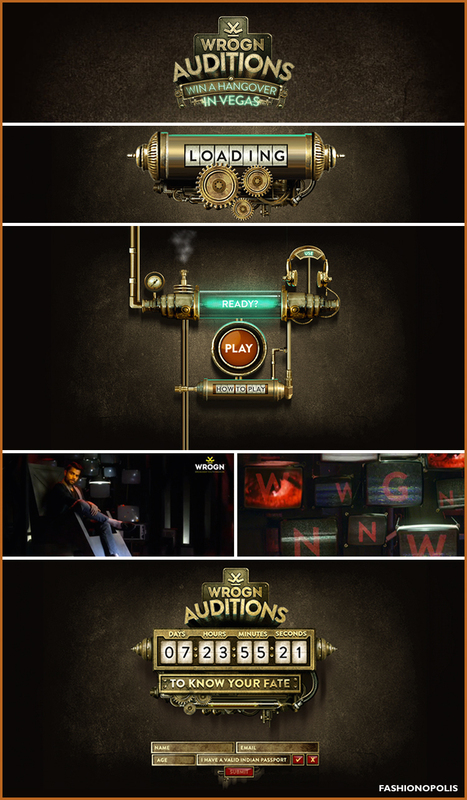 As much as I would like to share more about the Wrogn Auditions, I do not want to spoil the fun of the game for you. My only suggestion is, go and give it a try. You never know, you just might be the lucky one to win a Hangover in Las Vegas. What are you waiting for? Start playing now! Who knows, you could be the wrogn one to win it all! The recently concluded Lakmé Fashion Week Winter/Festive 2015 saw designers showcasing their best offerings for the upcoming season. While some managed to get everyone buzzing with their ingenuity, others, played it safe. However, there were a few designers who managed to create innovative pieces while staying true to their own roots. Tarun Tahiliani’s ‘Easy Glamour’ was one such collection that managed to offer something novel and original at the same time stayed true to the designer’s trademark aesthetics. Second time round collaborating with Reliance Trends, this collaboration offers Tarun the perfect platform to showcase his ready-to-wear line. Seeking inspiration in a variety of things, strong Russian and Central Asian influences could be spotted in the bold and colourful stripes and exotic prints. Shiraz inspired mosaics along with carpet weaves and concentric borders gave the collection a sophisticated tribal gypsy vibe that complement the theme of easy separates and fusion styling. A traditional autumn winter palette, the collection was a great mix of black creations with occasional bursts of rust, mustard, steel grey, olive and blue. The silhouettes were a blend of structured pieces and drapes. From capes, capelets, jumpsuits and saris to kaftans, tunics and shift dresses, the collection had something for everyone. 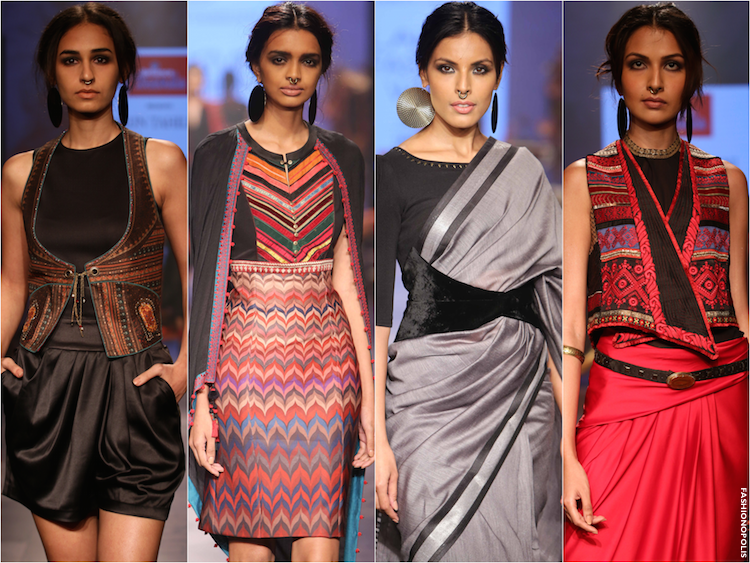 Saris and kurtas were paired with gilets and capelets and kedia style blouses with skirts. 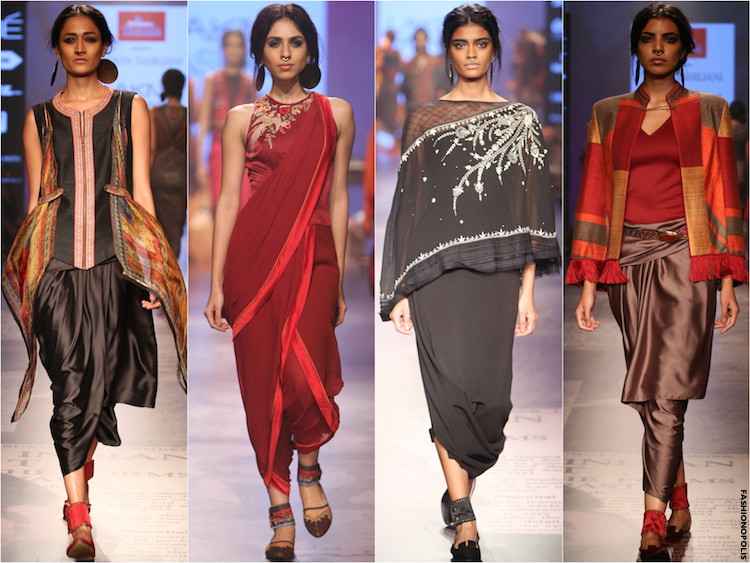 Satin draped lungi cowl gowns, saris with velvet obe belts and printed tees with dhotis, offered an interesting mix of silhouettes and style. Evolving from the dhoti sari, the star of the collection was the jumpsuit sari. The traditional sari gets reinvented yet again till it’s a jumpsuit with pleats and a draped dupatta requiring only a single zipper to fasten it. Bringing a glamorous end to the show was the sultry Chitrangada Singh in a black draped gown and velvet and gold embellished cape. 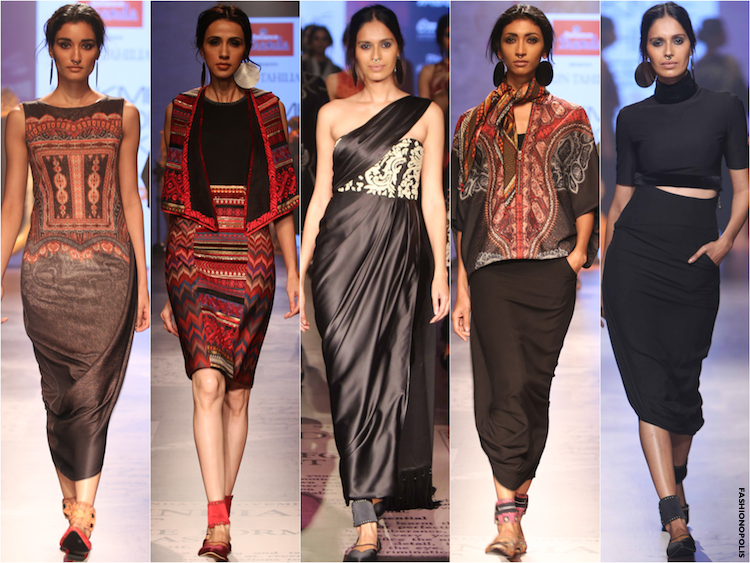 The standout feature of the collection is the Indo-Western fusion and easy to mix and match separates. For this collection, Tarun uses his couturier skills to create a prêt collection that is aesthetically beautiful, versatile and contemporary. Tarun Tahiliani is not just one of India's leading designers he is also one of my favourite. One of the few designers who consistently season after season showcases stellar collection that leaves you spellbound and wanting more.